When searching for the best pre-workout for running, there are a couple of specific things you need to keep in mind. Shopping for the best running pre-workout is quite different from shopping for any normal pre-workout supplement. Most trainers who are looking for a recommended pre-workout are usually interested in helping their gym performance in regards to explosive energy and focus. These trainers typically have a 45-minute to 1-hour workout in which they attack the weights or the rowing machine really hard (like Crossfit). That is why most pre-workout supplements are stuffed with ungodly amounts of caffeine, nitric oxide boosters, creatine, and tons of other stimulants. But runners need something different. If you do High Intensity Interval Training (or HIIT), traditional pre-workouts might work well for you. But if you are interested in steady-state cardio or are training for a marathon or triathlon, you don’t want a supplement that is going to give you a burst of energy followed by a crash. You want a supplement that is going to keep you going and keep you focused on your long runs. With that in mind, the best pre-workout supplement for running is a supplement that isn’t crammed with caffeine and creatine. You need something that is going to nourish your body and support your running, not ruin it by making you crash or feel bloated. ​I’ve listed five supplements below that I believe are the very best pre-workout supplements for runners. 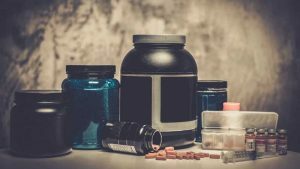 But before we get to those lets take a more detailed look at what the benefits of taking a pre workout are and what you should be looking for in a pre workout supplement. 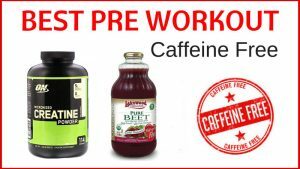 Benefits Of Taking A Pre Workout For Runners? Reduce perceived effort - Intervals, tempo runs - they can be hard! A reduction in the perceived effort of these sessions can only be a blessing and likely make your workout more effective and more likely that you will finish it. Increased muscle endurance - It is very easy for your legs to give up on you during a long run. A pre workout can help you run for longer without feeling awful or feel like you are dragging your legs around. Improved respiratory fitness - A pre workout can help with respiratory fitness - sometimes it feels like the lungs just don't have it when we do an effort session so support them with a pre workout. Greater usage of fat as an energy source - It is often said that the best way to get the body to run off fat is to do your runs fasted. Although it will feel awful at first, your body will get used to it and you will get efficient at using fat. This does work but you can also get this benefit by taking a preworkout too. Increased lean muscle mass - Being lean is an additional performance for any endurance runner. 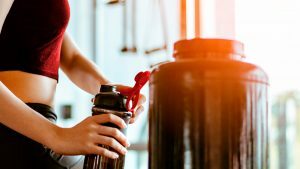 ​What Should Runners Look For In A Pre Workout Supplement? Running takes its toll on the body in a different way to HIIT or gym work; so with this in mind we have to look at pre-workout supplements in a different way than we would if we were training at the gym. 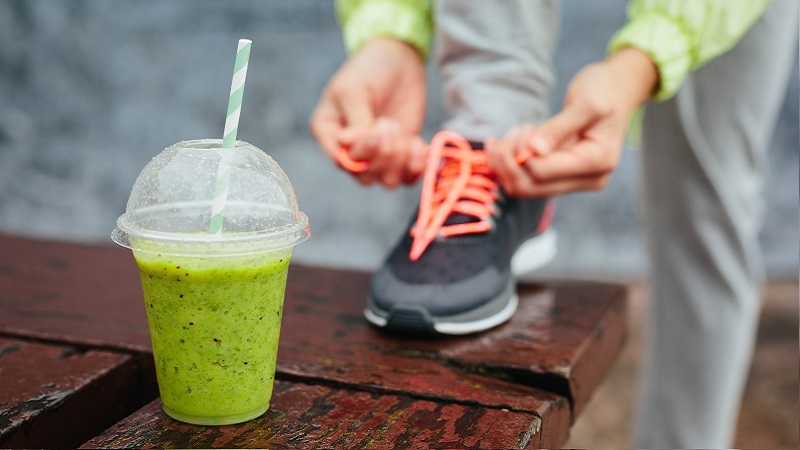 Below I have broken down what should be in your pre workout to help your body maintain endurance and stamina to get the very best out of your run session. Carbs, carbs, carbs - the Runner's mantra. Carbohyrdrates are so important for runners and most runners know this. The type of carb though is important. You want a supplement with a good amount of complex cabrohydrates to stabilize your blood sugar levels and keep you going. If your pre workout has too much simple carbs then the likelihood is you will get the dreaded crash - which is not exactly what you want mid run or anytime in a run! BCAAs (Branched Chain Amino Acids) are great for endurance running. BCAAs are essential amino acids but not produced by the body naturally. This means we have to get them from food. BCAAs produce protein and can help muscle trissue resovery as well as help improve the immune system. As a runner, you tend to get depleted doing intense endurance runs and thus your immune system ​becomes compromised. It is the very reason why marathon runners tend to get sick in their biggest training weeks before their race. BCAAs can be a great way to ward this off by supporting your immune system. BCAAs can also be used by the body when it is running low on gylcogen, giving you a great back-up system for an energy source as your workout progresses. A supplement in essential to get enough BCAAs during running, as your body will not get enough from food alone as you tend to burn through it. BCAAs will also ensure you have a faster recovery from your workout and an overall better quality session. It will also lower your percevied exertion so your run may even feel easier! It is also worth noting that BCAAs can also help with weight loss and help build lean body mass. These are certainly things that can help running performance. ​The benefits to including a BCAA are numerous and thus it is well worth including in your ​pre-workout routine. Beta Alanine has been widely accepted as a great nutrient for endurance training and performance. Beta Alanine is particularly helpful when it comes to your lactate threshold. In fact Beta Alanine's primary benefit is its ability to allow you to sustain efforts above lactate threshold. Your lactate acid threshold is defined as the rate at which there is a balance between lactic acid production and lactic acid elimination. You should be able to sustain an even pace from 60 mins or so (depending on your pace and fitness) at this level. If you go above your lactate threshold this is when you can no longer eliminate lactic acid build up faster than it is being produced. This results in you slowing down - you can no longer sustain the pace. It is generally understood that it is carnosine that plays the key role in the lactate threshold. Carnonsine levels are regulated by Beta Alanine. It has been shown that intra-muscular carnosine levels can be improved by up to 87% through intense training which thus improves lactate threshold of these individuals. ​However if you were to supplement carnosine it would not have the same result that intense training gives. Instead it is beta alanine that is key. Supplementing this increases intra-muscular carnosine because it needs to be present in order for carnosine levels to increase. One study showed that consuming Beta Alanine for 4-8 weeks results in increased carnosine levels by 42-65% (Pottier 2007, ​Hill 2007). Increasing this allows the body to buffer more lactate and eliminate more of it. It increases your threshold. It's like a dream! If you are like most runners, how fast you can run and for how long is really important to you. Increasing your lactate threshold will make you a faster runner and Beta Alanine can help you with this. This is the perfect supplement ingredient to include before a tough session. Remember though it takes a minimum of 4 weeks to see significant increases in carnosine levels so you can't expect miracles after one session. ​My 90 Day Trial: ​I experimented with beta alanine for 90 days to see if it would help my running. You can check out my results and thoughts here​. Electrolytes are potassium, sodium, calcium, magnesium, phosphate, bicarbonate, sulfate and chloride. The 4 major electrolyes are sodium, magnesium, calcium and potassium. These maintain the body's fluid balance. ​As a runner, keeping your electrolyes balances is really important for a great performance or a great workout. If they are not balanced then you may experience problems during your run. Symptoms of electrolye imbalance incloudes cramping, side stiches and muscle fatigue as well as nausea, dry mouth and decrease urine output. ​When you run, you lose electrolytes through your sweat. When you cramp it is your body's way of letting your know you are low. Electrolytes generally need to be replenished after an hour or so running. You can opt to take electrolytes in a pre workout or afterwards. If it's hot it maybe worth opting for both before and after. If you do don't just opt for sodium - this tends to be the favored electrolyte. Another consideration when it comes to electrolytes is are you a major sweater? If you sweat more than the average joe, electrolyte consumption is going to be more important for you. Includes complex carbs to stabilize blood sugar levels during exercise. Contains no simple sugar - so no sugar crash to deal with. Also has alpha-l-polylactate that buffers acid production reducing the burn durnig exercise and also post exercise muscle soreness. Now this is a supplement that is really engineered for long-distance runners and is one of the top pre-workout supplements for running. It has complex carbohydrates to fuel your running and stabilize blood sugar. Most pre-workouts have too much simple sugar, which, along with the massive amounts of caffeine, causes the nasty crash. 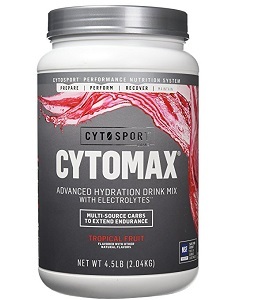 But with Cytomax Sport Energy, there is no simple sugar and there is no crash. You can just keep going and going. It also has an ingredient called alpha-l-polylactate, which helps to prevent acid production in your muscles. This effectively stops lactic acid build-up, better known as the “burn”. It also helps minimize muscle soreness after you’ve worked out, which will help you recover faster. This supplement also has a little bit of caffeine, but not too much (35mg, the same amount as a cup of coffee), and some nitric oxide boosters to help improve oxygen uptake. On top of all that, it tastes great (try Tropical Fruit), mixes well, and makes your running even more fun and rewarding. If you’re looking for the best running pre-workout, you’ve found it. PROS – ​Easy to mix, tastes good and has no simple sugars. Also contains alpha-l-polylactate which prevents lactic acid build up. CONS – ​Contains some artifical flavors and not vegan friendly. This supplement also has a little bit of caffeine, but not too much (35mg, the same amount as a cup of coffee), and some nitric oxide boosters to help improve oxygen uptake. On top of all that, it tastes great (try Tropical Fruit), mixes well, and makes your running even more fun and rewarding. If you’re looking for the best running pre-workout, you’ve found it. PROS – ​​​Easy to mix, tastes good and has no simple sugars. Also contains alpha-l-polylactate which prevents lactic acid build up..
CONS – ​​​Contains some artifical flavors and not vegan friendly. I’m a very big fan of the Optimum Nutrition company. I think they do great supplements and really care about their customers. They also have one of the greatest pre-workout supplements for running. This supplement doesn’t have the massive amounts of caffeine you find in other pre-workouts. It just has 100mg of caffeine, which is like a big cup of coffee. It also has BCAAs, glutamine, citrulline, antioxidants, NO boosters, and an electrolyte blend. This is great for runners but also great for anyone who wants a pre-workout supplement that isn’t too harsh. This one is great for improving your recovery too, so if you’re training for a marathon or an event that requires daily dedication, this is the pre-workout supplement for you. Get it in the delicious Fruit Fusion flavor. 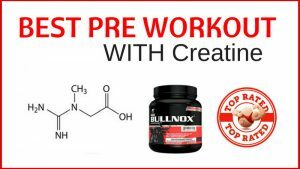 PROS – ​Contains beta alanine and og of sugar so no sugar crash to worry about. CONS – ​Although has a great range of flavors, it is recommended to pick your falvor wisely if you want something delicious. PROS – ​​Contains beta alanine and og of sugar so no sugar crash to worry about. ​One of the best pre-workout supplements for runners comes from one of my favorite supplement companies: Cellucor C4. The reason why this is so great for running is because it it’s not too intense but still gives you a valuable boost in performance. It’s got a moderate amount of caffeine along with Cellucor’s C4’s Energy Blend.People interested in sprinting or setting weightlifting personal records are probably going to look past this supplement in favor of something with more kick. But this is perfect for long-distance runners.If you’re feeling a bit tired before your run or you’re having one of those days and you really don’t want to lace up your running shoes and hit the track, just take a scoop of this supplement mixed with 4-6oz. of water about 20-30 minutes before training and you will be a new person! As for flavor, my favorite is Blue Raspberry but I think they all taste great. PROS – ​Good consistent energy and contains beta alanine which taken regularly with help you train above lactate threshold and improve speed. CONS – ​Not effective for some people. 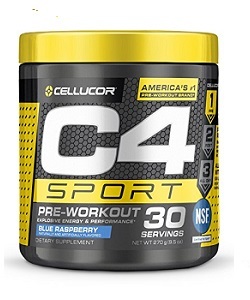 ​​One of the best pre-workout supplements for runners comes from one of my favorite supplement companies: Cellucor C4. ​Specially formulated for athletes of all types. ​​You might be hesitant to try MusclePharm and might think me foolish for giving it a top spot among the best pre-workout supplements for running but that’s because you’re thinking of the MusclePharm Assault that you see bodybuilders chugging down on legs and back day. 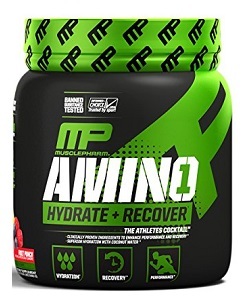 MusclePharm Amino 1 is a completely different breed of pre-workout supplement and is the best pre-workout for running if you’re looking for something without creatine and caffeine and just filled with good nutrients. 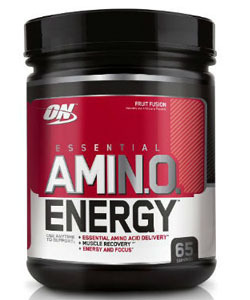 Amino 1 has 10g of BCCAs with every scoop in a 3:1:2 ratio and also has a load of electrolytes and coconut water to help improve your running endurance, keep you hydrated, and speed up recovery. There’s also a nice dose of citrulline malate, which will boost your nitric oxide levels and ensure smooth flowing nutrients throughout your body. I love this supplement and always drop a scoop of the delicious Cherry Limead flavor into my sports shaker before a long evening run. PROS – ​Includes coconut water for advanced hydration and absorbs quickly. Hydration and recovery properties make it a great all in one. CONS – ​Some disappointed in the flavor. Specially formulated for athletes of all types. Includes coconut water for advanced hydration. PROS – ​​Includes coconut water for advanced hydration and absorbs quickly. Hydration and recovery properties make it a great all in one. CONS – ​​​Some disappointed in the flavor. Okay, so there’s no caffeine, no creatine, no nitric oxide boosters. 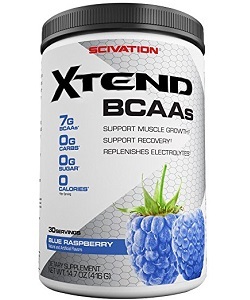 In fact, Scivation Xtend is just a BCAA supplement. But that makes it sound like it’s a bad thing when in actual fact this truly is one of the greatest pre-workout supplements for runners, if not one of the greatest supplements ever (in my humble opinion). This truly is a powerhouse supplement and I recommend it as a must-have staple for runners. I have always used this on an empty stomach for steady state and long-distance morning cardio and it has always helped me a lot. Xtend delivers a research-proven ratio of branched chain amino acids, along with leucine and glutamine, without any carbs or sugar. It improves recovery, makes running easier, preserves muscle mass, mixes easily, and is gentle on the stomach. What more could you possible ask for? It also tastes amazing and is one of my favorite tasting supplements of all time (I recommend Blue Raspberry). This will really help you power through a cardio session. It’s also great for when you’re craving candy but have to diet. PROS – ​Improves recovery, makes running easier and mixes well. CONS – ​Some flavors aren't for everyone. ​Okay, so there’s no caffeine, no creatine, no nitric oxide boosters. In fact, Scivation Xtend is just a BCAA supplement. This truly is a powerhouse supplement and I recommend it as a must-have staple for runners. I have always used this on an empty stomach for steady state and long-distance morning cardio and it has always helped me a lot. Xtend delivers a research-proven ratio of branched chain amino acids, along with leucine and glutamine, without any carbs or sugar. It improves recovery, makes running easier, preserves muscle mass, mixes easily, and is gentle on the stomach. CONS – ​​​Some flavors aren't for everyone. 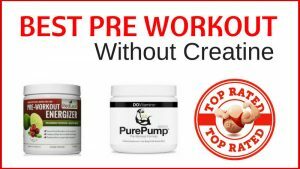 Personally, if I was looking for the best pre-workout for running, I would pick up all five of the supplements listed above because each one is perfect for different situations and each one is the best running pre-workout in its own right. On the days you need a big boost, or if you are feeling sluggish in the morning, you will want to have some CytoSport, Optimum Nutrition, or Cellucor C4. On the days when you don’t need a stimulant boost and just need the nutrients that will aid your performance and improve your recovery, I suggest you reach for the MusclePharm and Scivation. They’re all great pre-workout supplements for runners and are sure to take you to the next level. Don’t the NO booster cause excessive muscle pump for runners? The NO is to increase muscle pump, for a runner that would make me think you’re not going to get a long run if your legs are all pumped up in a mile or two? I noticed when i use some of the above products that i have a harder time running them if i don’t. However i like the extra energy it provides. Any alternatives?